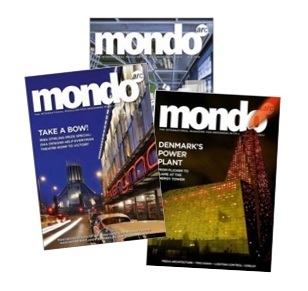 Please find below a full archive featuring recent and past digital issues of Mondo Arc Magazine – the Leading International Magazine in Architectural Lighting Design. DARC Awards • Architectural Winners Reveiled • Liz West Interviewed • David Adjaye Profile • Simes Ghost Reviewed. 2016 Darc Awards / Architectural – 400 entries, 6000 votes. Who will come out on top? Light + Building 2016 Review • The Technology_The Design_The Disappointment? As Light + Building 2016 draws ever closer, the MONDO*ARC editors have put together a comprehensive product preview to help streamline your visit to the show. Aside from the essential, this issue pays tribute to the wonderful with a theatrical theme, showcasing the beauty of light and its influence on the big stage. This includes London’s National Theatre, Chicago’s Ryan Centre, Hamburg’s Mehr! Theatre and an interview with Tony Award-winning theatrical lighting designer Paule Constable. Continuing in the pursuit of creativity, this issue covers an array of light art festivals such as Lumiere London 2016, Amsterdam Light Festival 2015-2016 and Enlighten Manchester. Illuminating Icons: SSL Membership shine a new light on UNESCO world heritage sites across the UK. Take a Bow! Riba Stirling Prize Special: DHA Designs help Everyman Theatre Romp to Victory. Light + Building & May Design Series Review • Euroshop Review • Susan Brady Interviewed. Mondo arc : The International Magazine for Designers with Light. The mondo*arc digital editions mean you can read mondo*arc anytime, anywhere. You will find every article and interview as you would in print but with additional rich content such as easy to click through links to relevant online pages. Benefit from the convenience of online delivery combined with the look and feel of a printed magazine.